This article is about city. For other, see Qarshi (disambiguation). 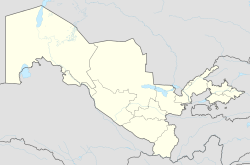 Qarshi (Uzbek: Qarshi / Қарши; Persian: نخشب‎ Nakhshab; Russian: Карши Karshi) is a city in southern Uzbekistan. It is the capital of Qashqadaryo Region and has a population of 197,600 (1999 census estimate). The population of Qarshi on April 24, 2014 is approximately 222,898. It is about 520 km south-southwest of Tashkent, and about 335 km north of Uzbekistan's border with Afghanistan. It is located at latitude 38° 51' 48N; longitude 65° 47' 52E at an altitude of 374 meters. The city is important in natural gas production, but Qarshi is also famous for its production of woven flat carpets. Originally the Sogdian city of Nakhshab, and the Islamic Uzbek (Turkic) city of Nasaf, and the Mongol city of Qarshi (pronounced Kharsh), Qarshi was the second city of the Emirate of Bukhara. It is in the center of a fertile oasis that produces wheat, cotton, and silk and was a stop on the 11-day caravan route between Balkh and Bukhara. The Mongol Chagataid khans Kebek and Qazan built palaces here on the site of Chinggis Khaan's summer pasture. In 1364, Timur also built a fortified palace with moats in what is now the southern part of the city. The modern name "Qarshi" means fort. With the decline of Shahrisabz in the 18th century, Qarshi grew in importance, and was the seat of the Crown Prince to the Emirate of Bukhara. The city had a double set of walls, 10 caravanserais and 4 madrassahs during this time. By 1868, the Russians had annexed the Zarafshan Valley, and in 1873, the treaty turning Bukhara into a Russian protectorate was signed in Qarshi, much to the dismay of the Emir's son, Abdul Malik, who took to the hills in rebellion. 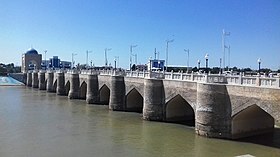 In the early 1970s, the first section of a major irrigation project was completed to divert water from the Amu Darya River in Turkmenistan eastward into Uzbekistan in order to irrigate the land surrounding Qarshi. Almost all of these irrigated lands around Qarshi are planted with cotton. Köppen climate classification system classifies its climate as cold semi-arid (BSk). A gas-to-liquids (GTL) plant, located 40 km south of Qarshi, is under construction. This plant will be based on Sasol’s GTL technology and will have a capacity of 1.4 million metric tons per year, with following product slate: GTL diesel, kerosene, naphtha and liquid petroleum gas. The total cost of the project is around $4 billion and it is the first such a high-tech plant on the Eurasian continent. The joint project GTL Uzbekistan, where Sasol and Uzbekistan’s state oil company Uzbekneftgas each hold 44.5% interest, and the rest 11% belonging to Malaysian Petronas, was founded in 2009. The plant will be built on the basis of the Shurtan gas and chemical complex. Qarshi is home to FC Nasaf which was founded in 1986. Nasaf plays its home matches at the Markaziy Stadim, built in 2006. Qarshi is served by Karshi Airport with flights to Tashkent, Navoi and some major Russian cities. Abu al-Mu'in al-Nasafi (d. 508 AH/1114 CE). Abu Hafs Umar an-Nasafi was a Muslim jurist, theologian, mufassir, muhaddith and historian. A Persian scholar born in Transoxiana, he wrote mostly in Arabic. Wikimedia Commons has media related to Qarshi. ^ a b "Climate: Qarshi - Climate graph, Temperature graph, Climate table". Climate-Data.org. Retrieved 2 September 2013. ^ "Uzbekistan Launches $4 bn GTL Joint Project with Sasol". The Gazette of Central Asia. Satrapia. 23 July 2012. Retrieved 23 July 2012. This page was last edited on 26 March 2019, at 14:55 (UTC).